On June 10th in Washington D.C. Natalie Roe, Director of the Physics Division at Berkeley Lab, testified at a congressional subcommittee hearing on the future of particle physics, prompted by the recent release of the Particle Physics Project Prioritization report. In addition to detailing the excitement of particle physics’ past and present, Roe presented a case for its bright future, all the while focusing on the importance of small-scale experiments that deliver groundbreaking discoveries. She also spoke of the mystery of dark energy—an unexplained force that appears to be accelerating the expansion of the universe—and outlined an exciting new effort called the Dark Energy Spectroscopic Instrument, or DESI, a small-scale project to be managed by Berkeley Lab. 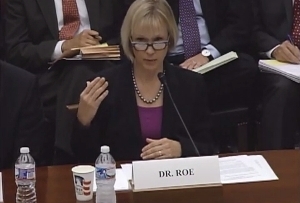 You can read Roe’s written testimony here. It’s been a busy month for Roe. On June 6th, she participated in a panel discussion at the Large Hadron Collider Physics Conference, hosted by Brookhaven National Laboratory and Columbia University. Called “The Road to Discovery” and moderated by New York Times reporter Dennis Overbye, the discussion gave Roe and other experts a chance to detail the future of collider-based particle physics research and potential forthcoming discoveries. You can read a summary of the LHCP Conference panel discussion in Symmetry Magazine here.